↑ Chin, H. B.; Sipe, T. A.; Elder, R.; Mercer, S. L.; Chattopadhyay, S. K.; Jacob, V.; Wethington, H. R.; Kirby, D.; Elliston, D. B. (2012). "The Effectiveness of Group-Based Comprehensive Risk-Reduction and Abstinence Education Interventions to Prevent or Reduce the Risk of Adolescent Pregnancy, Human Immunodeficiency Virus, and Sexually Transmitted Infections". American Journal of Preventive Medicine. 42 (3): 272–294. PMID 22341164. doi:10.1016/j.amepre.2011.11.006. ↑ Gizzo, S; Fanelli, T; Di Gangi, S; Saccardi, C; Patrelli, TS; Zambon, A; Omar, A; D'Antona, D; Nardelli, GB (October 2012). "Nowadays which emergency contraception? Comparison between past and present: latest news in terms of clinical efficacy, side effects and contraindications.". Gynecological endocrinology : the official journal of the International Society of Gynecological Endocrinology. 28 (10): 758–63. PMID 22390259. doi:10.3109/09513590.2012.662546. ↑ Duffy, K.; Lynch, D. A.; Santinelli, J. (2008). "Government Support for Abstinence-Only-Until-Marriage Education". Clinical Pharmacology & Therapeutics. 84 (6): 746–748. PMID 18923389. doi:10.1038/clpt.2008.188. ↑ 12.0 12.1 Rowan, S. P.; Someshwar, J.; Murray, P. (2012). "Contraception for primary care providers". Adolescent medicine: state of the art reviews. 23 (1): 95–110, x–xi. PMID 22764557. ↑ 13.0 13.1 World Health Organization Department of Reproductive Health and Research (2011). Family planning: A global handbook for providers: Evidence-based guidance developed through worldwide collaboration (PDF) (Rev. and Updated ed.). Geneva, Switzerland: WHO and Center for Communication Programs. pp. 260–300. ISBN 978-0-9788563-7-3. ↑ Carr, B.; Gates, M. F.; Mitchell, A.; Shah, R. (2012). "Giving women the power to plan their families". The Lancet. 380 (9837): 80–82. PMID 22784540. doi:10.1016/S0140-6736(12)60905-2. ↑ 16.0 16.1 Cleland, J; Conde-Agudelo, A; Peterson, H; Ross, J; Tsui, A (Jul 14, 2012). 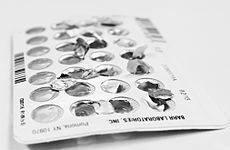 "Contraception and health.". Lancet. 380 (9837): 149–56. PMID 22784533. doi:10.1016/S0140-6736(12)60609-6. ↑ Ahmed, S.; Li, Q.; Liu, L.; Tsui, A. O. (2012). "Maternal deaths averted by contraceptive use: An analysis of 172 countries". The Lancet. 380 (9837): 111–125. PMID 22784531. doi:10.1016/S0140-6736(12)60478-4. ↑ 18.0 18.1 Canning, D.; Schultz, T. P. (2012). "The economic consequences of reproductive health and family planning". The Lancet. 380 (9837): 165–171. PMID 22784535. doi:10.1016/S0140-6736(12)60827-7. ↑ Van Braeckel, D.; Temmerman, M.; Roelens, K.; Degomme, O. (2012). "Slowing population growth for wellbeing and development". The Lancet. 380 (9837): 84–85. PMID 22784542. doi:10.1016/S0140-6736(12)60902-7.